Throughout the thousands of years after Enlightenment, man has realised that the power of thought and intellect are powers beyond anything that the physical can bestow. A man may be strong but a man with a powerful mind may yet outwit him. Take that rhetoric and fast forward it to the current century and you have another idea – unleash the power of the mind through concentration and entrainment. All your goals and successes can be reached once you figure out how to be smarter, faster and happier at all times. The brain box atop your head is primary in controlling everything about you; using electrical impulses and the release of chemical reactions within the cerebrum to determine your daily physical and emotional functions. Now, the brain releases frequencies called brain waves that determine how well you do something and what you are capable of during your different states of wakefulness, sleep and near sleep. Scientists range them from the alpha waves all the way to the theta waves. Each of them are represented by frequency ranges that can go as low as below 1Hz and as high as 38Hz. They have been linked to states of heightened mental abilities, mental focus, relaxation, stress relief, super learning abilities and even patterns that are ideal for healing. Now imagine if you can focus this power and call upon it any time you want. 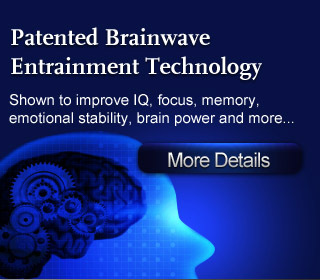 Brainwave entrainment is just that, using scientific or more traditional methods to relax the mind and trigger the brain to give off exact electromagnetic frequencies. Have a big exam the next day and can’t seem to remember anything? Then call upon the alpha waves that is familiar to the brain just before or after sleep and you can activate your super learning capabilities. Is stress raising your blood pressure to unacceptable levels and you need to find your place of Zen and total relaxation? Then find a quiet place and call upon the exact wave frequencies in your cortical (in the brain) and put yourself into a deep trancelike state where the body heals and relaxes. Got a big project and need to inject some creativity into your campaign? Well there are always the low theta waves to help you with your creative visualisation. The amount of research done into this area of personal development and mental focus and release is gargantuan and the effects simply Olympian. Technology like magnetic fields given off by specially made machines or even binaural beats; engineered sound frequencies delivered into the lobe of the brain to invoke a specific pattern response – are just some of the examples of what you can use to get the benefits of brain entrainment. Already far afield in the medical industry and used to treat general illnesses, make healing faster and improve conditions that afflict the mind, imagine what you can do with this application for the purpose of self improvement. Don’t wait, unleash the power of the mind with entrainment and live a better and brighter life.